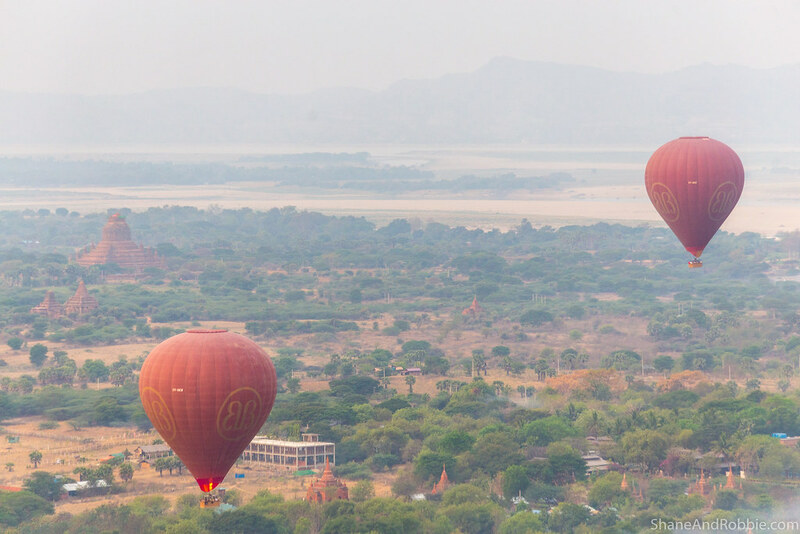 We’d been told that the best way to see Bagan is by hot air balloon, and so we were up at 4:30am to take a balloon over Bagan. 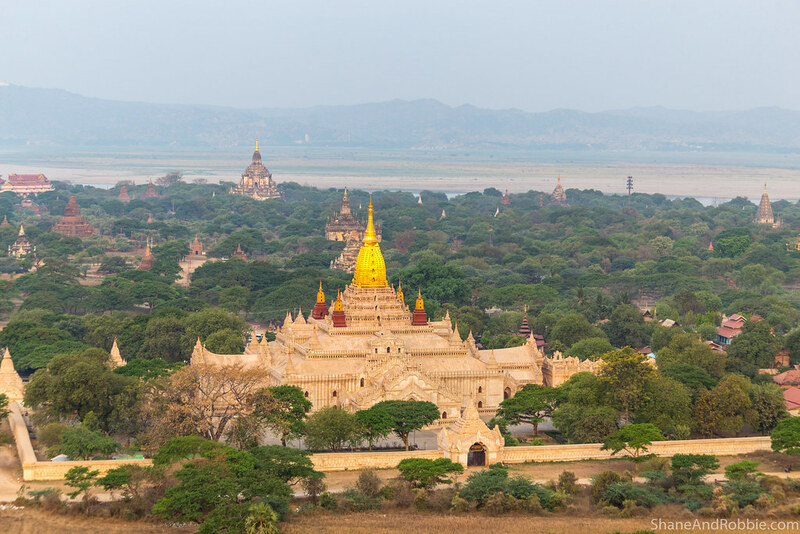 At about $500AUD per person, it’s a costly way to spend an hour but ended up being the highlight of our whole trip in Myanmar and was absolutely worth doing! 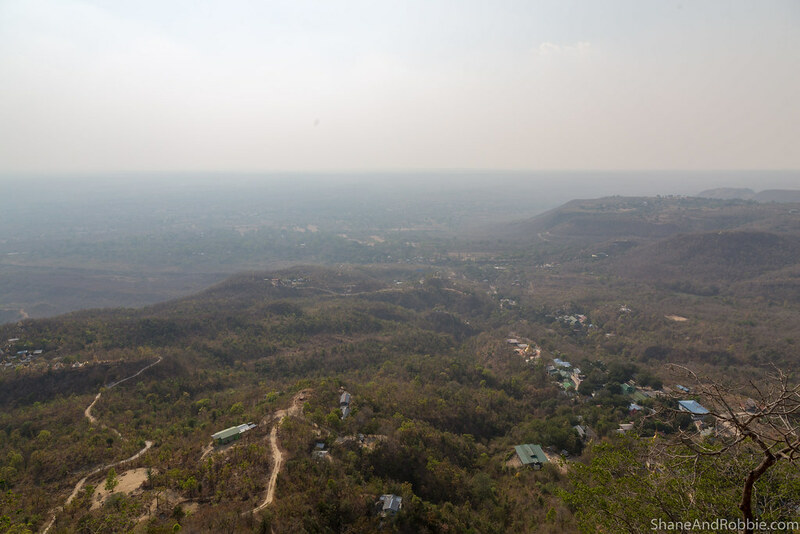 The bird’s eye views we got of this beautiful place will remain forever imprinted in our memories. To ensure we caught the sunrise, our morning started very early. We were due to be picked up at 5:00am and heard the wheeze and rattle of the bus picking us up before we saw him! 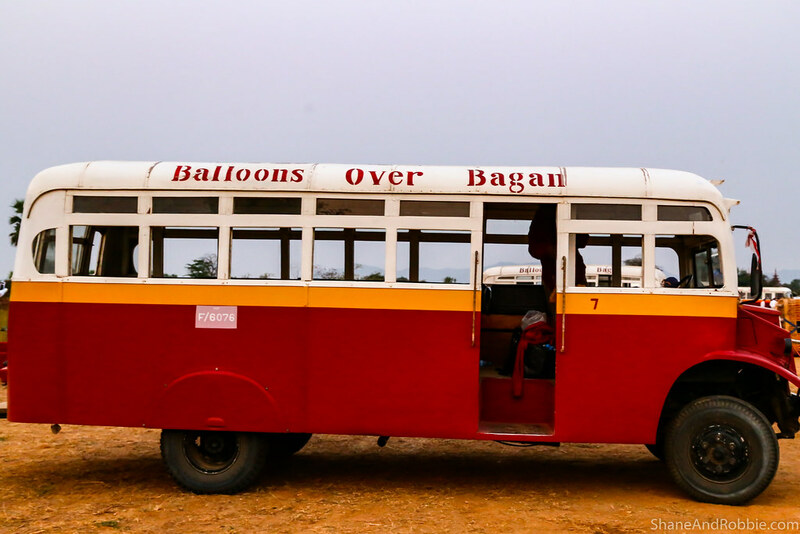 Turns out Balloons Over Bagan, the company we flew with, has a fleet of World War II era buses that they use to do the pick ups and drop offs. 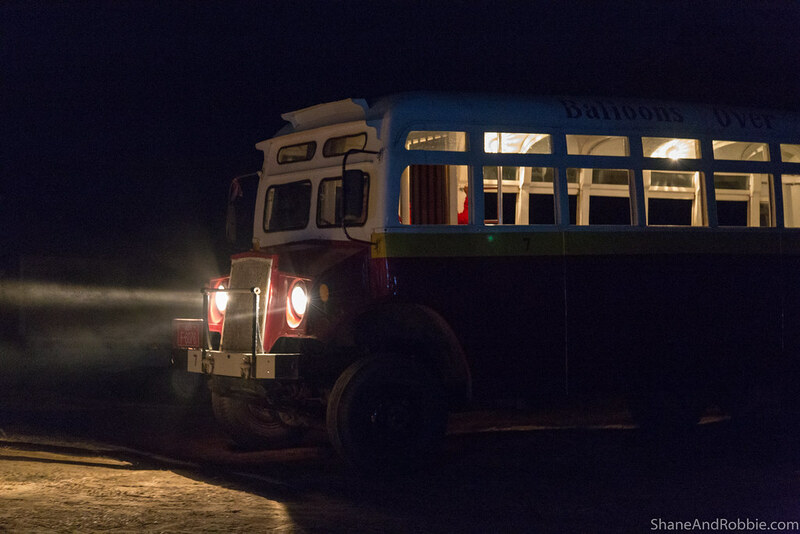 It was really cute, but one of the noisiest, roughest bus trips we’ve ever had! 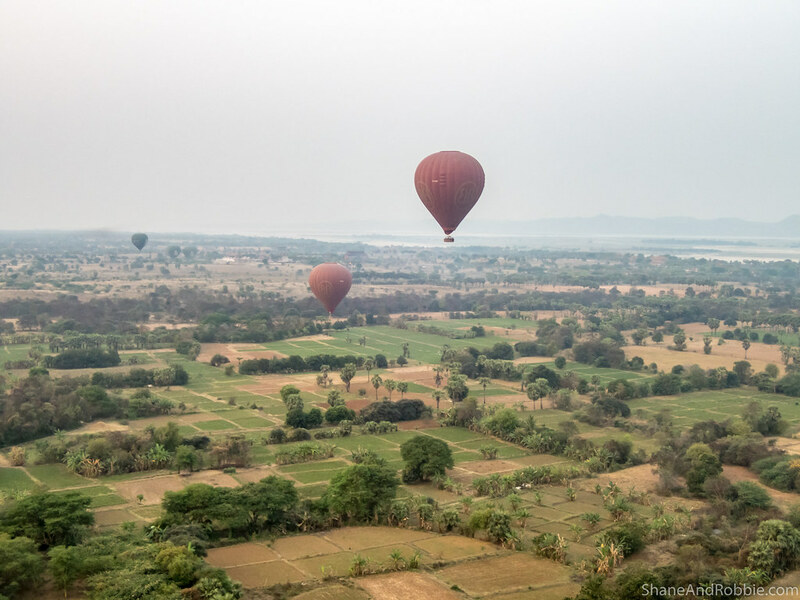 A short ride and we were deposited in a field, along with another 100 or so eager tourists, all keen to see Bagan from the air. We were offered tea/coffee and biscuits and sat perched on little camp chairs enjoying the snack as we were given a safety briefing. 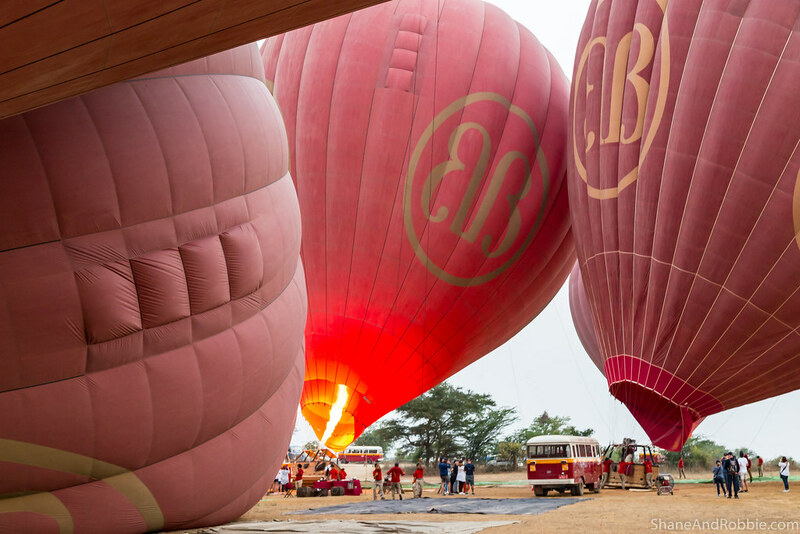 As the sky began to lighten, the balloons began to inflate. 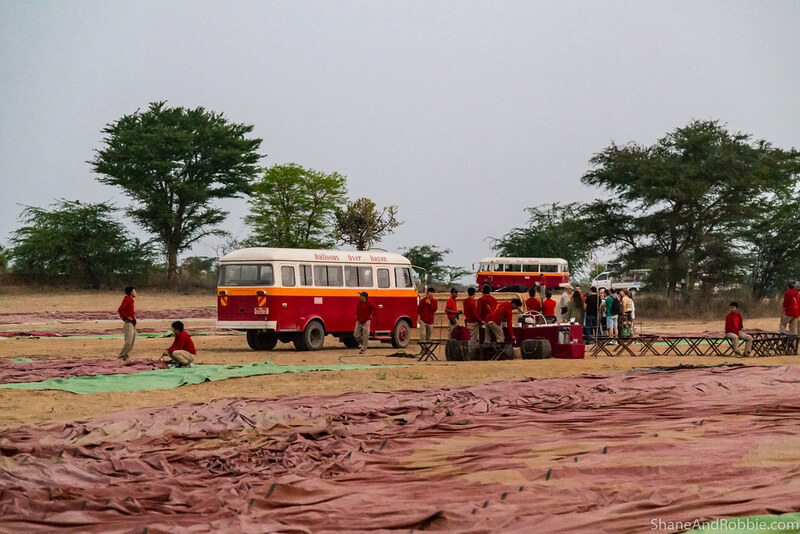 We watched the 12 balloons flying today get set up and inflated, taking photos of the blazing flames all the while. Our anticipation built as the balloons around us were inflated. Finally it was our turn and we were directed to jump in to our basket. 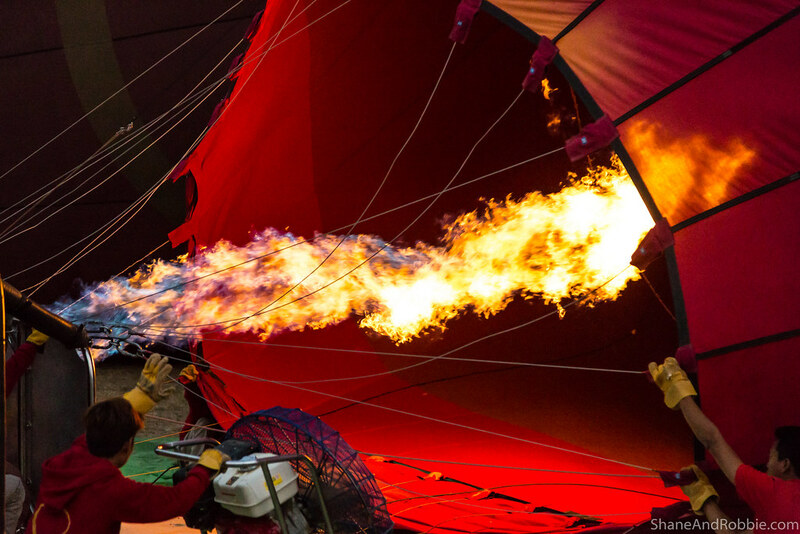 The blazing flame caused our balloon to slowly rise and we were up! 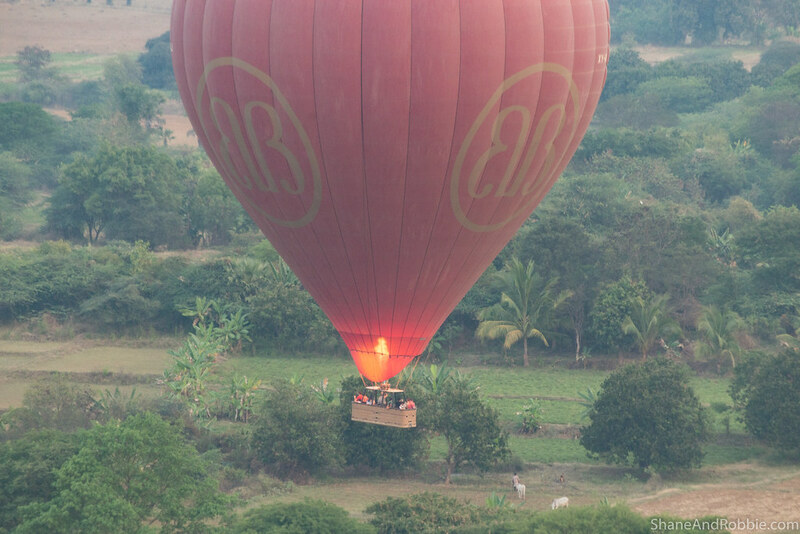 We all gasped and held on as our basket skimmed the top of the trees, but soon we were far far above the plains. 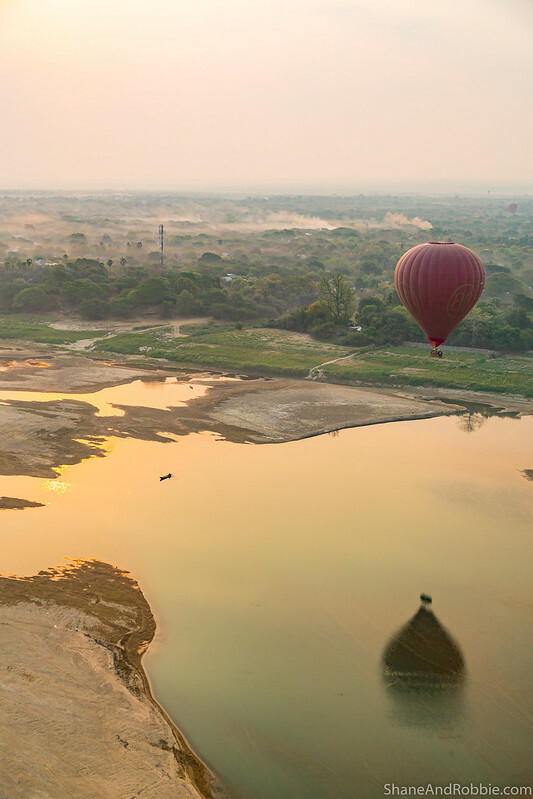 As the sun rose, our balloon soundlessly moved through the air. A morning mist covered the ground, making the landscape look magical. 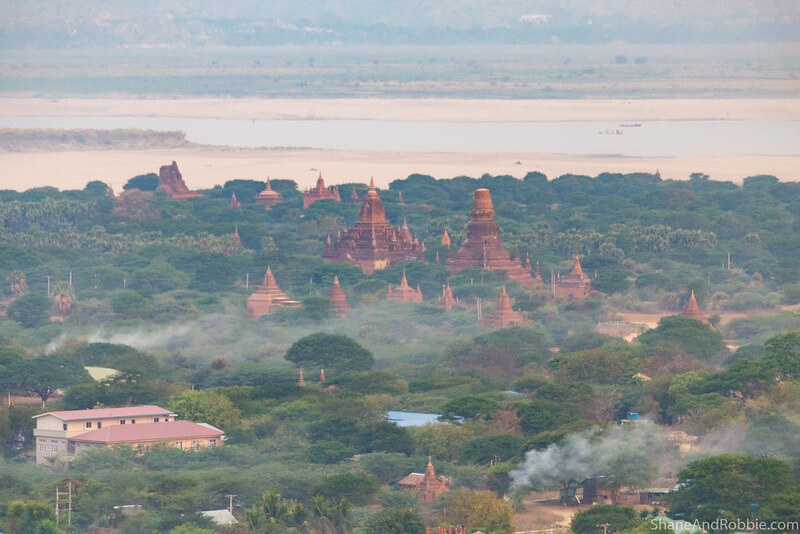 We could see fields, palm trees, and villages far below us, and soon the temples of Bagan came into view. The entire journey was very smooth, and extremely peaceful and serene. 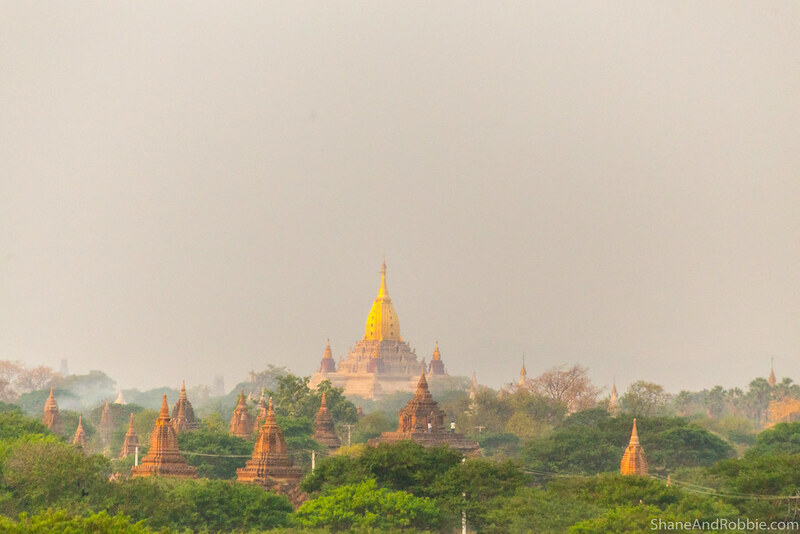 The only sound we heard was the roar of the flame from time to time, and everywhere we looked, temples peaked out of the trees. 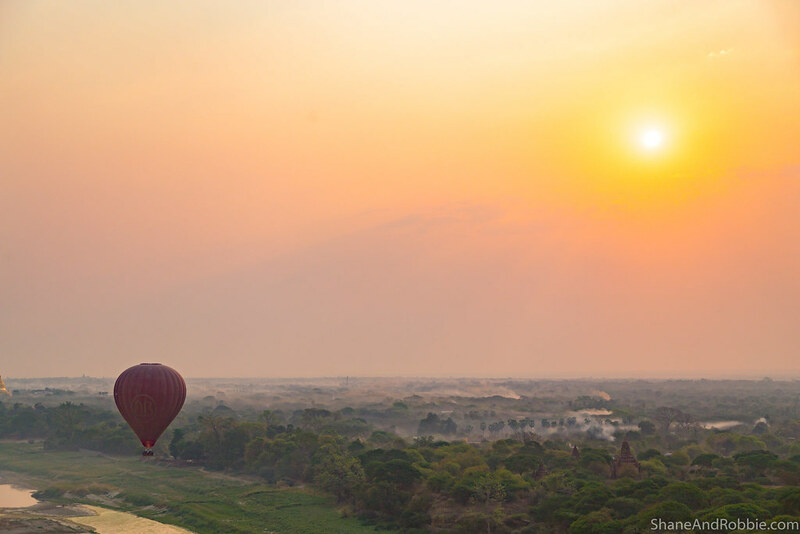 The subtle colours of dawn broke away to vibrant hues as the sun rose. The overall effect was magical. We learned in Cappadocia (Turkey) when we went hot air ballooning there that part of the magic of the experience is the balloons around you. 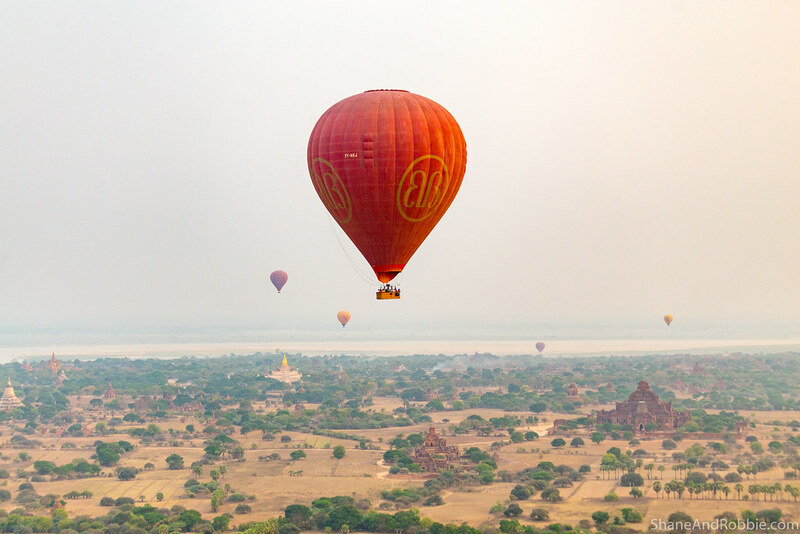 The views over the plains of ancient temples was phenomenal, but for me, having the experience with a dozen other balloons drifting across the horizon was the real highlight. We drifted approximately 10 kilometres over the plains, but all too soon it was time to land. 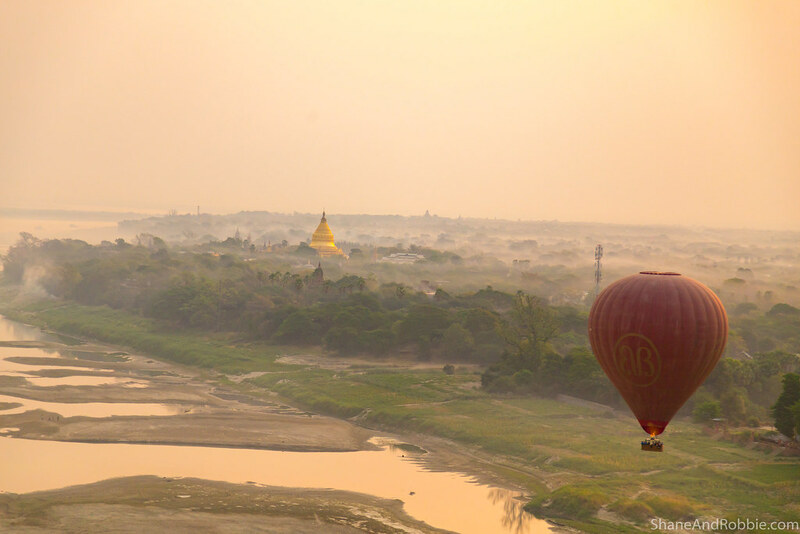 Given the direction of the wind today, we had to land on a sand bank in the middle of the Irrawaddy River. 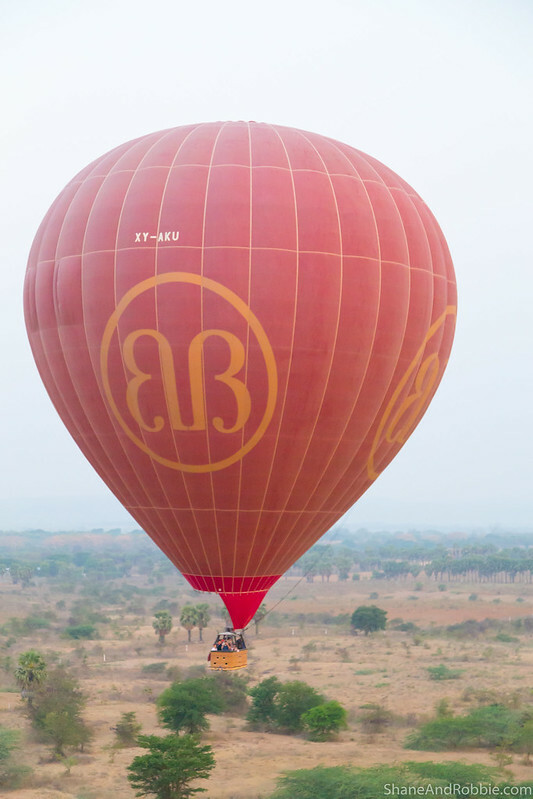 The benefit of this was that we got to enjoy a truly majestic view of the sunrise reflected in the waters of the river. 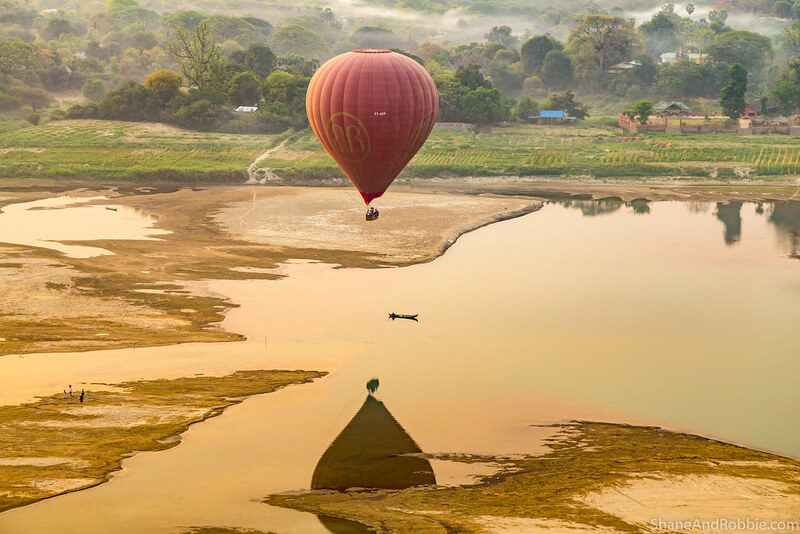 We landed smoothly enough and were soon out of the basket, sipping champagne, and eating croissants standing on this sand bank in the middle of the Irrawaddy River. Totally awesome! 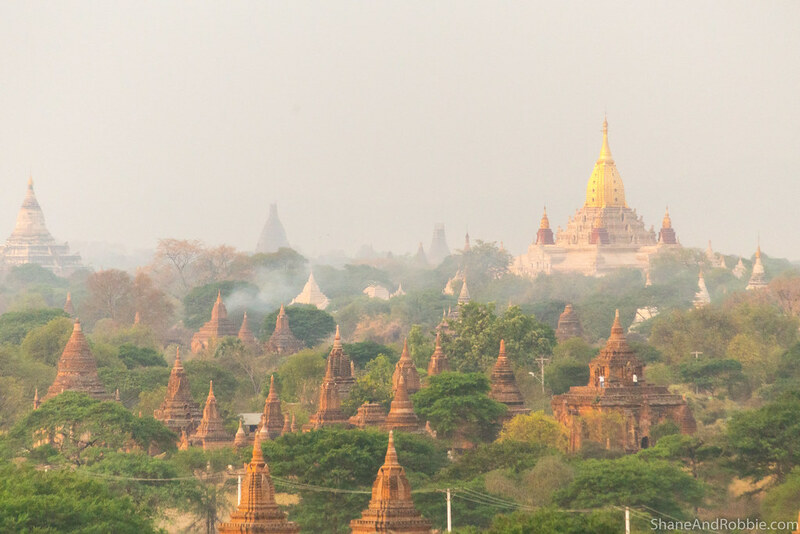 The euphoric high from our morning’s adventure carried through to our clunky bus trip home, breakfast, and even through the hour-long drive to Mt Popa, our other activity of the day. 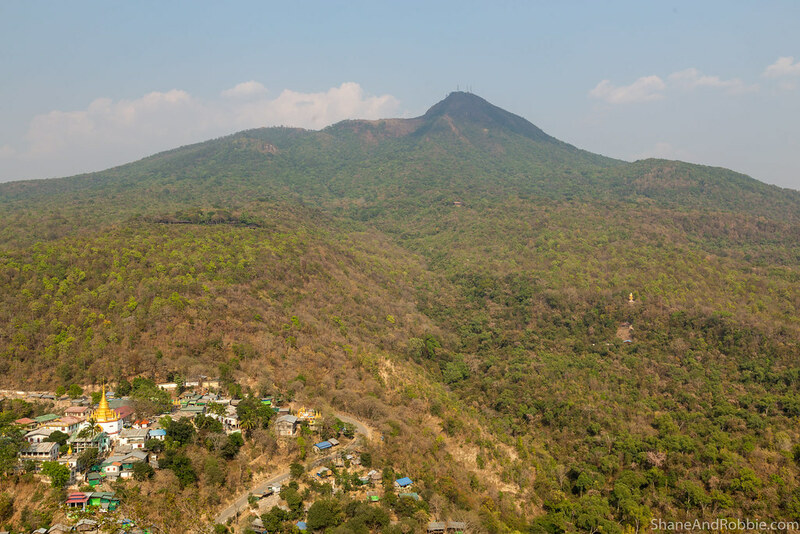 Mt Popa is about 50km South of Bagan and warrants a visit as, at its peak, sits the Taungkalat shrine. 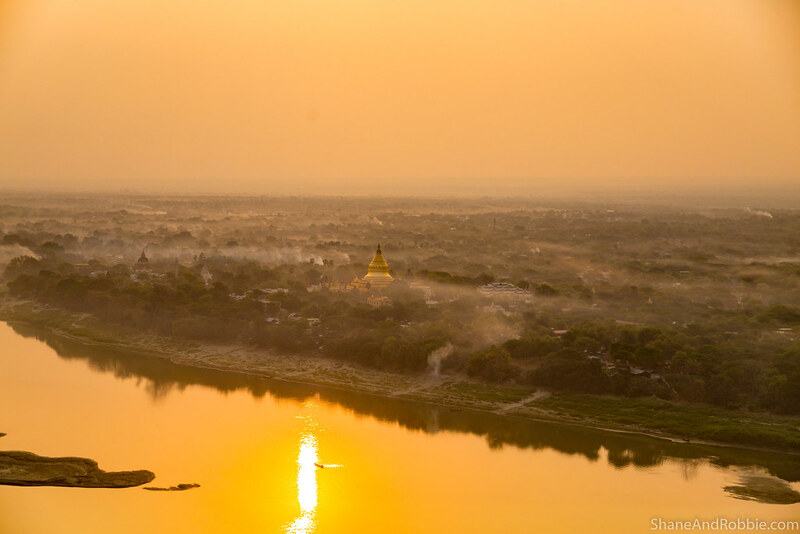 This golden temple is dedicated to 37 of the major nats, or aminist spirit entities, that are worshiped alongside Buddha here in Myanmar. These nature spirits were once so important to the country’s early Kings that it was essential for them to consult the nats before commencing their reign. 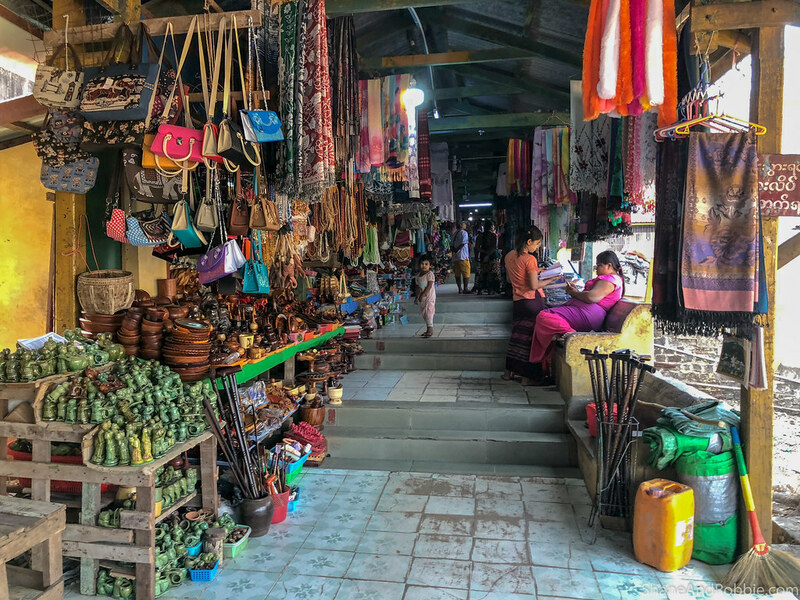 At the base of the volcanic plug that is Mt Popa we found a chaotic market, with hundreds of locals milling around buying offerings to take up the mountain to the nats. Strolling amongst the people were numerous Rhesus macaques who reside in the area and feed off the scraps and offerings left by pilgrims who come to worship the resident nat spirits. 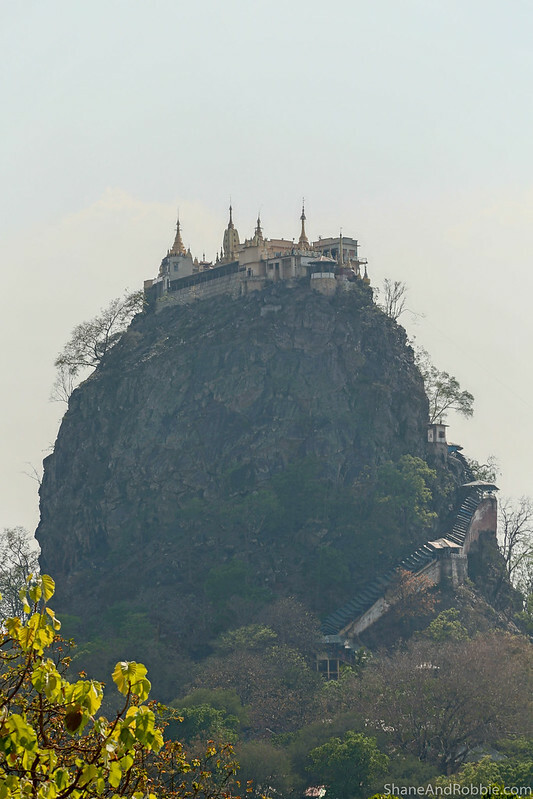 At 1,500m in height, Mt Popa is quite a hike – and a steep one at that! 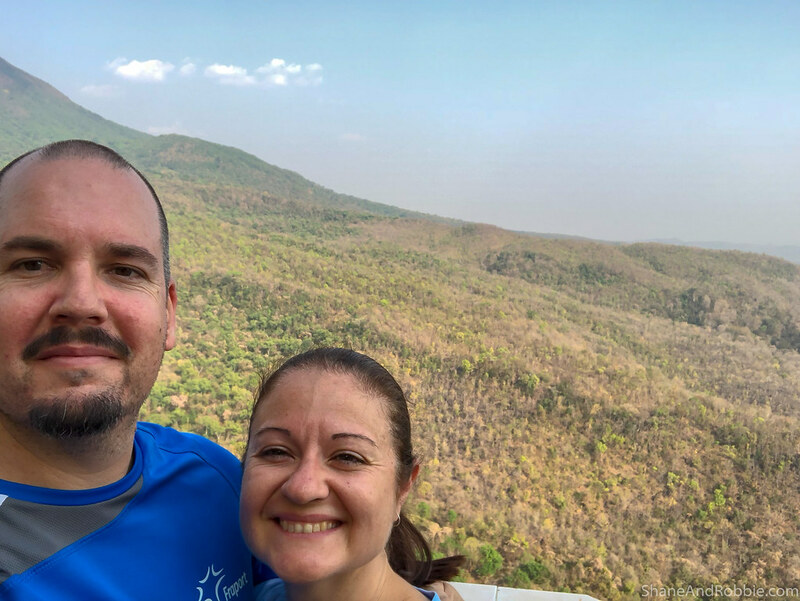 The climb was made all the more interesting as we had to leave our shoes at the base and climb the 777 steps to the summit barefoot. It was quite sticky along the way and lots of monekys means lots of monkey poop, so, errrr…, mind your step! 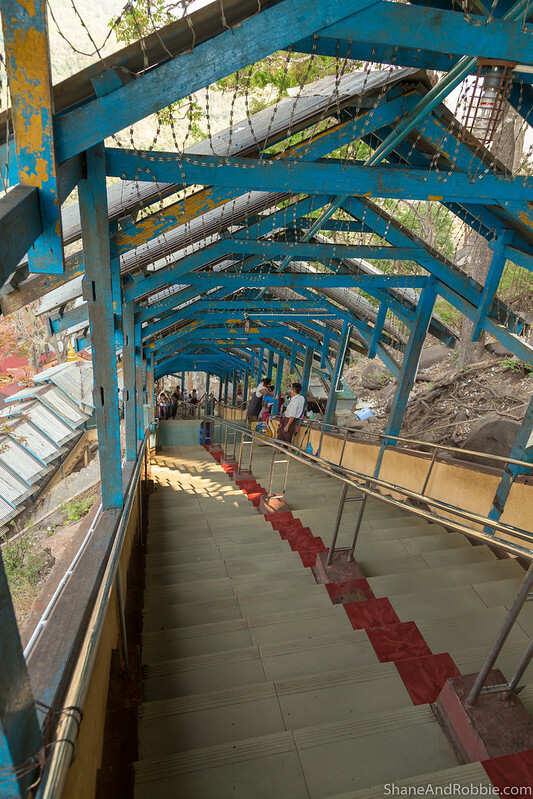 The stairway to the top was covered, keeping the worst of the sun’s heat at bay. And all along the way to the top there were shops selling food, snacks, offerings, and souvenirs. The biggest attraction, however, seemed to be (once again): US! 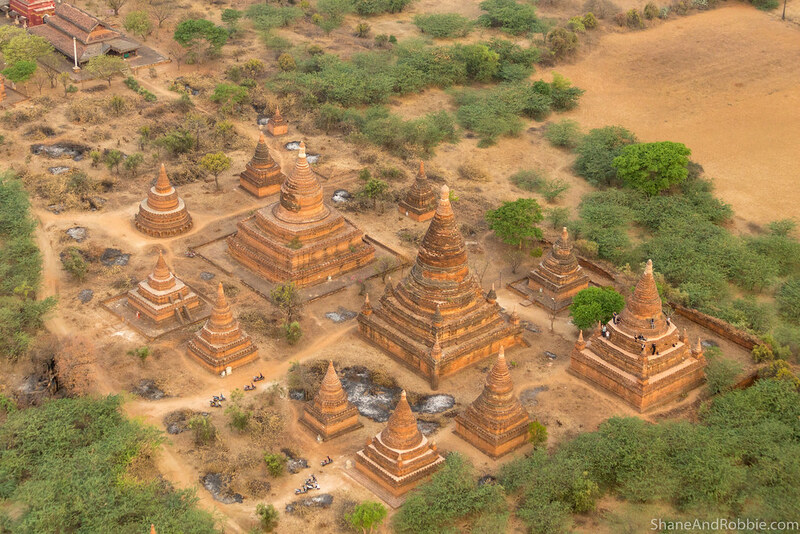 It’s quite endearing seeing how curious but shy the local people can be when they see us. We had our photos taken a few times and, in turn, took a few photos of our own – mostly of the beautiful landscape! 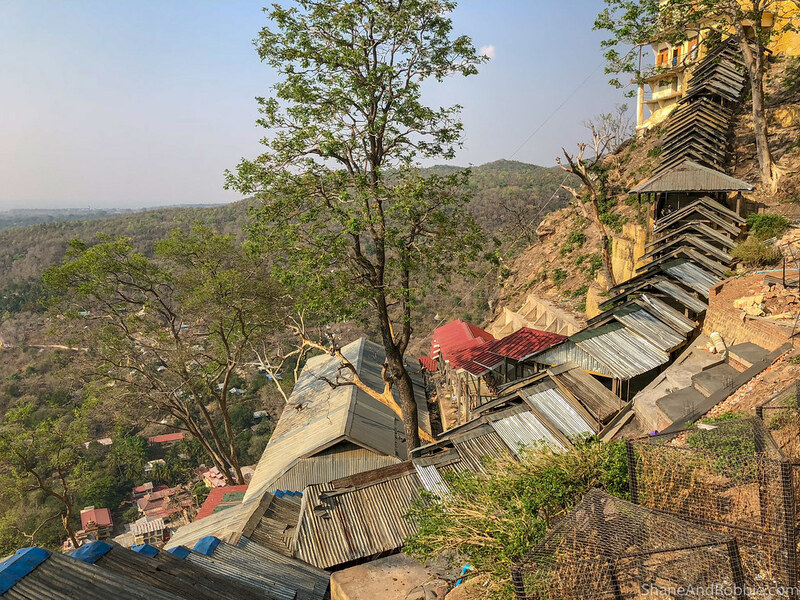 Returning from Mt Popa we spent the rest of the day relaxing, reflecting on the great week we’ve had here in Myanmar and eager to see what the rest of our stay brings!